A Summary can be found at the bottom of the page. Reload the page at each visit to receive any updates. Not a good match either - "across the country it was a windy day". Look carefully at the bottom left hand corner to see something white at the edge of the frame. 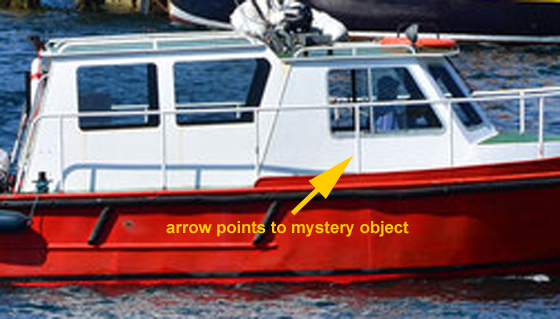 What on Nessie Hunter IV (above) could that white part of the boat possibly be? 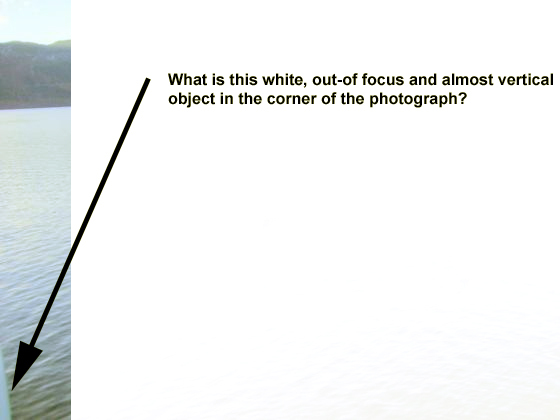 There is no part of that boat which would correspond with the object in the photograph. Let's try a different boat. © Copyright TheTurfBurner , from Geograph.org NM8529. 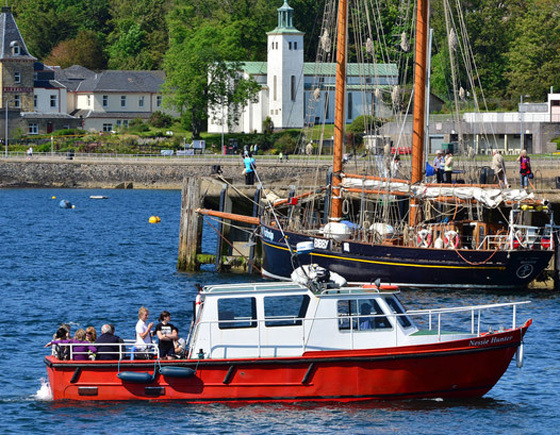 Nessie Hunter III, George Edwards' previous boat has exactly what we are looking for, shown here in Oban where it was working in 2011. So it would appear that the photo most likely was not taken on either of the dates stated due to the weather, or even in the year stated due to the wrong boat being partially included in the picture. Keen observers have commented that although Mr Edwards is quoted as saying the object was about half a mile away from him in the "November 2011" photo, it looks much closer than that. In the sountrack above, Mr Edwards says " ... and you can see the castle in the top right hand corner of the photograph so you will be able to work out for yourselves that I was much farther down the loch near Lochend when I took that picture." The top of the castle tower - height 25 m above water level - aligns well with the summit of Carn Dearg 277 m above loch level in the background, beyond Foyers. We can project a line from the hilltop, through the castle tower and down into the loch. The distance between the hilltop and the castle is known to be 10,790 metres so it is a simple matter of solving similar triangles the get the range to the water surface, which comes out at 11,860m. So the sight-line from the hill-top enters the water 1070 metres past the castle, and the angle at the hilltop = inverse tan (11860/ 277) is 88.66 degrees. If the camera was shooting under the handrail from the skipper's window we can estimate a camera height above the water of 2.0 metres, so the distance NH to Z divided by 2.0 metres = 11860/277so the sight line enters the water 86 metres past the camera, so the camera was 1070 - 86 = 984 m from the tower. Knowing the distance of the camera from the castle with reasonable accuracy, and knowing its height, we can scale the photograph and the tower is calculated to be 1.45 degrees in height. By measurement from the photo the object of interest can be seen to be 8 times the castle height below the horizon and so some 9.5 metres horizontally from the camera. It appears to be about 0.60 metres or 24 inches long. Further discussion of the nature of the object is unnecessary . All of this should not come as a surprise, of course as George Edwards did say at the end of the soundtrack that the last time he saw one of the creatures was on 13th May 2003 - over 9 years earlier. Break - …submersibles, whether it be a submarine or an ROV a remotely operated vessel, it is it is pretty much a waste of time putting them down there you can’t see anything. It doesn’t matter how bright a light you use under the surface because the light will just reflect back off the peat particles in the water a bit like driving a car in the fog or snow in the dark with the headlights on full beam. The light just reflects back at you. The only way to get any visibility down there is to use low wattage lighting and even then you are limited to seeing only two or three feet around you. Very poor visibility down there as you will see you when I put the underwater camera down. This has always been a problem when it comes to investigating under the surface of luck less. This has always been the problem when investigating under the surface of Loch Ness. Lack of visibility and quite simply lack of technology. Sonar, these gadgets up here, will certainly tell you there is something down there, in but it could be an inch long or ten feet long - sonar cannot tell the difference. All it does is measure a change of distance and density. But there is no doubt at all in my opinion that the existence of these creatures; far too many people have been seeing them for far too long to be dismissed as just a legend in or tourist attraction . Since the nineteen thirties alone there has been about a thousand eye-witness reports, now all these people cannot be telling lies or imagining things. And of course there has to be more than one of them in the first recorded sighting was by Saint Columba in 565 A.D. And to suggest there is only one creature in almost one and a half thousand years is stretching longevity and old age a bit far. On many occasions two or three have been seen at the one time. Oops Dept. In the days of film any competent photographer or processor could spot evidence of tampering which might escape the eye of the casual viewer. In the age of digital imaging we do not have negatives, but there are little files hidden in the pictures which a researcher can sometimes find. Look below at what I found in one online version of his monster picture. 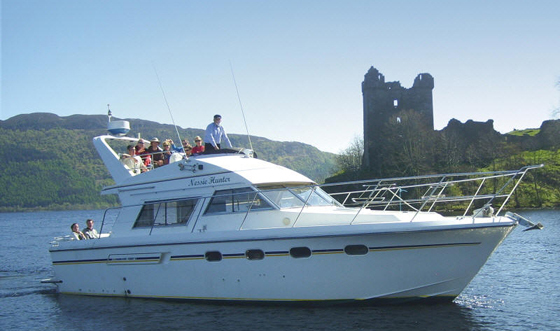 On 14th August 2012 I had the opportunity today to take the Castle Cruises tour boat to my calculated location for the Edwards photography. I had no monsters to hand but I did have a 25 cm long Buxton Spring Water 1 litre bottle, which I threw into the water and photographed. The results are shown below. The similarities between the "November 2011" photograph and my own photograph of a bottle show clearly that the object in the former was only a few metres away from the camera, and not "half a mile away". 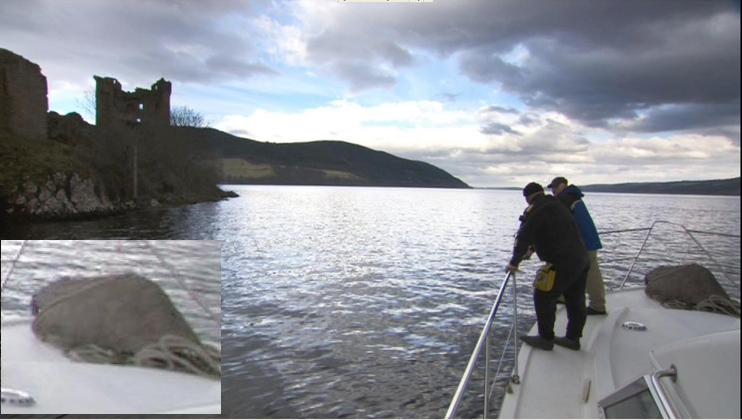 Steve Feltham has pointed out the close similarity to a plastic "monster hump" used in the making of a tv programme "Loch Ness Monster: The Ultimate Experiment". In photographs I have seen the hump appears to be 1.5 to 2 metres long, substantially longer than my calculations suggested and this could be accounted for if a photo of the "monster hump" had been digitally superimposed on the background photograph at a reduced scale. The original image file is unfortunately not available for inspection. On 21st August 2012 I visited Steve Feltham at Dores and was shown the glass-fibre hump. My measurements showed it to be about 1.9 metres long and 0.3 metres high, and clearly the same object as portrayed in George Edwards postcards and press releases. The question I cannot answer at present is how such a large object has been shrunk down to the 0.6 metre (approx) object in the image distributed by Cascade News. Either my calculations and bottle simulation (above) are wrong by a factor of 3, or the image has been digitally manipulated and the whole episode is a hoax. 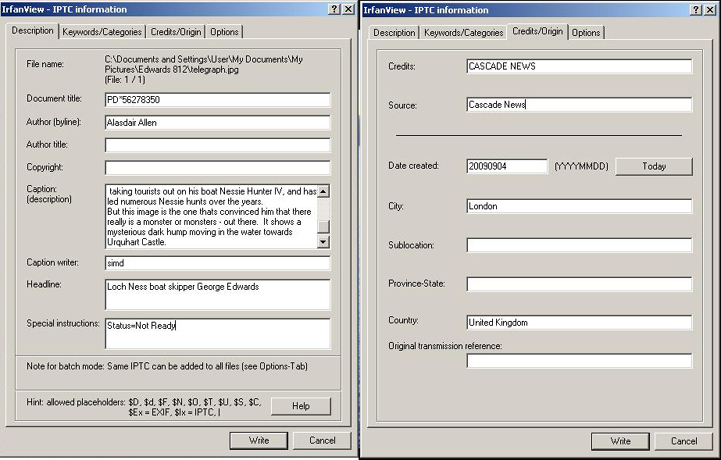 More IPTC data from an online version of the "November 2011" photo is shown below. This data is generated by the photographer or others after the photograph was taken. The glass-fibre hump at Dores Beach. Photo - Steve Feltham. Who shrunk the monster? 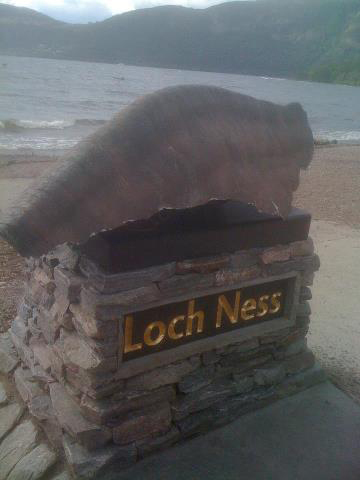 On 23rd August 2012 I reviewed my recording of "The Truth Behind the Loch Ness Monster", filmed at Loch Ness in early 2011. At 5 mins 48 sec into the film, just after divers have entered the water, there is a shot of two men on George Edwards boat with the glass fibre hump on the foredeck. I have enlarged the fore-deck object as an inset in the frame below from the tv show. Since the page was originally composed Steve Feltham has uncovered both a film-makers "prop" that fits the object in the "November 2011 Photograph", and pointed us to various sequences in "The Truth Behind the Loch Ness Monster" by Zig Zag Productions which show the glass-fibre hump on the deck of George Edwards boat during the filming in early 2011. My doubts about the boat part included in the photograph were based upon the almost vertical object in the bottom left corner of the photograph which I could not reconcile with any part of the deck fittings on Nessie Hunter IV. I have now found one on the fly bridge - arrowed in red below. 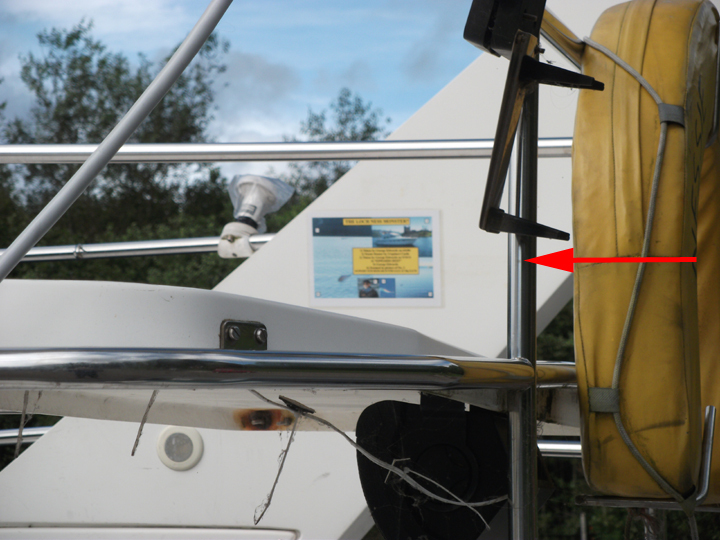 In the "TTBTLNM" documentary the boat still had dinghy davit fittings in place at the stern which also have vertical elements. The finding of this structural feature - one of four similar vertical handrail supports on the fly bridge allows a recalculation of the camera height to about 4 metres, places the camera about 85 metres closer to Urquhart Castle at 900m range, and doubles the range to the hump to 17.5 metres. It now would appear to be about 2 times bigger than my original calculation, and so 1.2 metres long on the water. Of course some of it's actual length of 1.9 metres would be submerged so there is no significant conflict in the data. The weather conditions in the "November 2011" monster photo match those in the documentary. 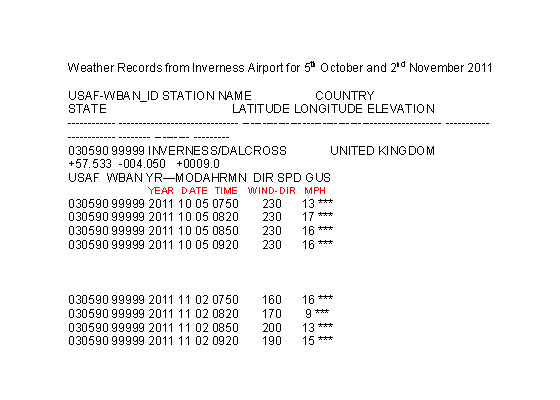 5/ November 2011 Photograph - The known weather records don't match the conditions shown in the "November 2011" photograph on either of the dates he has given. 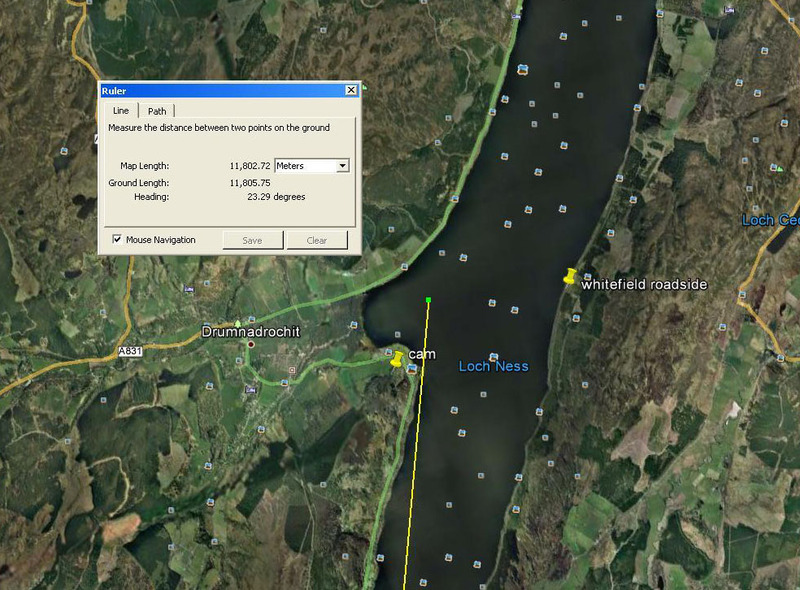 6/ November 2011 Photograph - The embedded data in one of the "November 2011" photographs names the photo agency and bears a date of "20090904"
7/ November 2011 Photograph - George Edwards claims the photo was taken "near Lochend" when it was clearly taken in Urquhart Bay, some six miles away. 8/ June 2012 Audio commentary In his audio commentary of June 2012 he states he last saw one of the creatures on 13th May 2003. 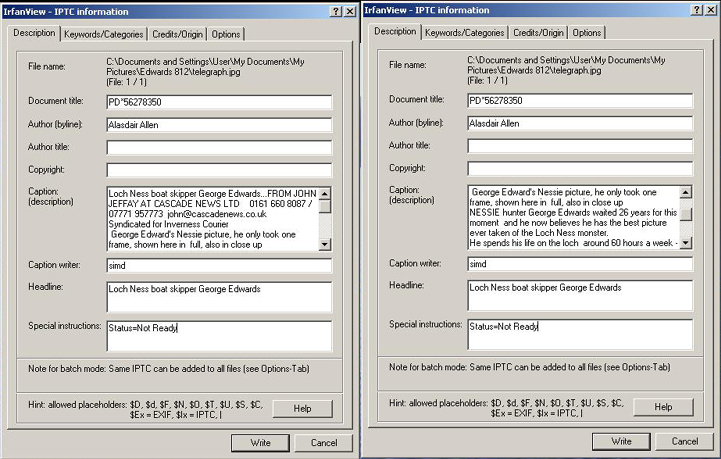 The page was modified on 18/08/2012 with revised camera height data and minor changes to text.